question_answer1) Which of the following pouch has more money? question_answer2) Which of the following you can buy from note? 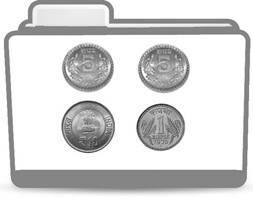 question_answer3) Which set of coins shows Rs. 5? question_answer4) can be taken from? question_answer5) Mohan has four Rs. 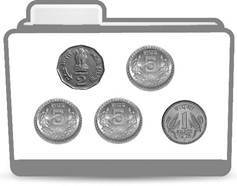 5 coins, out of which he gave 3 Rs. 5 coins to buy a toy. How much money, he is left with? question_answer6) Which of the following note does not exist? question_answer7) Money is counted in terms of notes and _________ . question_answer8) Identify the note given in the picture and choose the correct option? question_answer9) Which of the following will you use to buy a toy car of Rs. 50? question_answer11) Which note you will use to pay for the given item of worth Rs. 9? question_answer12) Raghu has following money in his Piggy Bank. Count the money. question_answer13) Meena wants to buy a bag worth Rs. 200. She has Rs. 150. How much more money does she need to buy the bag? question_answer14) How much cheaper is the handkerchief than the ice-cream? question_answer18) Shalu has four Piggy Banks. Tell with which Piggy Bank, she can buy a box of strawberries worth Rs. 18? question_answer19) Neeta wants to purchase a doll of Rs. 30. Which of the following matches she can use to purchase the doll? question_answer20) Which of the given notes is of least value? question_answer21) What is the total of following notes? question_answer22) How many 50 paise coins make Rs. 5? question_answer23) Read the following sentences and choose the correct answer True (T) / False (F). Coins are metal form of money. Money is paid while buying things. Money is received on selling things. question_answer24) Cost of three items are Rs. 7, Rs. 9 and Rs. 3 respectively. Find the total cost of 3 items? question_answer25) Ravi purchased 2 pencils worth Rs. 8, crayons worth Rs. 10 and a notebook worth Rs. 20. How much money in total he spent on purchasing these items? question_answer26) Which two objects have the same price? question_answer27) Which of the following has maximum price? question_answer28) Which object costs the least? question_answer29) How many objects cost less than Rs. 5? question_answer30) How much you pay if you buy the kite and the pencil? question_answer31) Study the given information and answer the following questions. Bala put Rs. 1 into his Piggy Bank on the first day. He put Rs. 2 on the second day, Rs. 3 on the third and Rs. 4 on fourth day. How much money does Bala have in his Piggy Bank after 4 days? question_answer32) How much will 6 oranges, 5 bananas cost? question_answer33) Rita went to a shop. She had Rs. 10 with her. She purchased one pencil of Rs. 2 and 2 erasers worth Rs. 4. How much money is left with Rita? 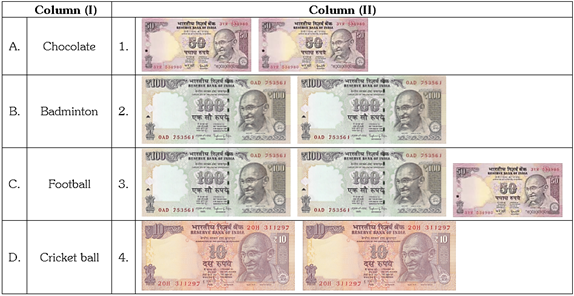 question_answer34) Match the currency images with their total value? question_answer35) Sam went to market and purchased some items. He had three Rs. 2 coins and one Rs. 10 note. How much total money he had? 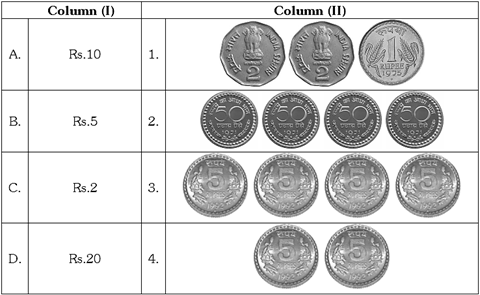 question_answer36) Find out the wrong statement; A: Five 50 p coins are equal to Rs. 2.50. B: Two 25 p coins are equal to Rs. 1. C: Five Rs. 10 notes are equal to one Rs. 50 note. D: Two Rs. 1 coins are equal to Rs. 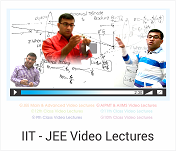 2.
question_answer37) Deepak purchased a T-shirt worth rupees four hundred. Which of the following represents this amount? question_answer38) Which one of the following items can be purchased with Rs. 50? question_answer39) John has one Rs. 50 note, one Rs. 20 note and one Rs. 10 note. Which of the following items he can purchase by spending total amount of money? question_answer40) Which two items Reena can purchase if she has one Rs. 100 note and one Rs.20 note? question_answer41) Golgi and his friends are playing in the park. Suddenly he found Rs. 100 in the park. He put the note in his pocket. After some time he saw an old lady is searching something in the park. If you were in place of Goldi. What will you do in such situation? 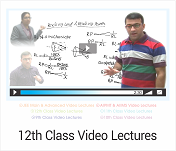 question_answer42) Rahul has Rs. 20 in his Piggy Bank. He wants to purchase two pencils worth Rs. 6. One candy of Rs. 1 and two chocolates of Rs. 10. How much money will be left in his Piggy Bank after purchasing these items? question_answer44) 50 will be equal to _____ . question_answer45) Match the items in the column (I) with the money in column (II) by which these items can be purchased? question_answer46) Which of the following statements is correct? A: Price of cricket bat is lesser than football. B: Price of Badminton is lesser than football. C: Price of chocolate is more than Badminton. D: Price of football is lesser than chocolate. question_answer47) Which of the notes and coins from the images are needed to make Rs. 35 exactly? question_answer48) Which of the following options is correct? 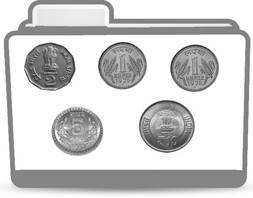 question_answer49) How many 25 paise coins are there in Rs. 6?